Hillary Clinton after giving her acceptance speech Thursday on the final day of the Democratic National Convention in Philadelphia. Check out all of our dispatches from the Democratic National Convention here. PHILADELPHIA — In contrast to Republicans, whose convention had a random-seeming parade of speakers each night, Democrats mostly hit their marks and stuck to the traditional convention script. Each day of the Democratic National Convention had an overarching strategic goal. Monday was about uniting the party. Tuesday was about telling Hillary Clinton’s life story (and, by extension, improving her dismal favorability ratings). Wednesday was about articulating forceful contrasts for swing voters and reminding them of the consequences of a potential President Trump. Thursday, with a lot of flag-waving and representation from the military, along with Clinton’s own remarks, was about establishing her credentials as commander in chief. Offstage, the proceedings weren’t always as smooth. A group of Bernie Sanders delegates — led by the rowdy California delegation — attempted a series of tactics to disrupt the proceedings, booing various speakers, Clinton among them, and staging a walkout after Clinton was officially nominated by roll call Tuesday night. These delegates represented a minority of the 1,865 Sanders delegates on the floor in Philadelphia — perhaps 250 Sanders delegates participated in the walkout — although they proved that a small, determined minority can draw a lot of attention to itself. On the flip side, the energetic and boisterous crowd at Wells Fargo Center helped the Democrats’ best moments pack more emotional punch, such as during the remarks by President Obama and first lady Michelle Obama, and by Khizr Khan, the father of a Muslim-American soldier killed in action. In short, the Democrats appeared to have a conventionally effective convention, and perhaps a very effective convention (which is not to say they had a perfect one). Conventions usually produce polling bounces. In the 1980s and 1990s, these bounces often stretched into the double digits, but they’ve been more modest in recent election cycles, averaging about 4 percentage points. 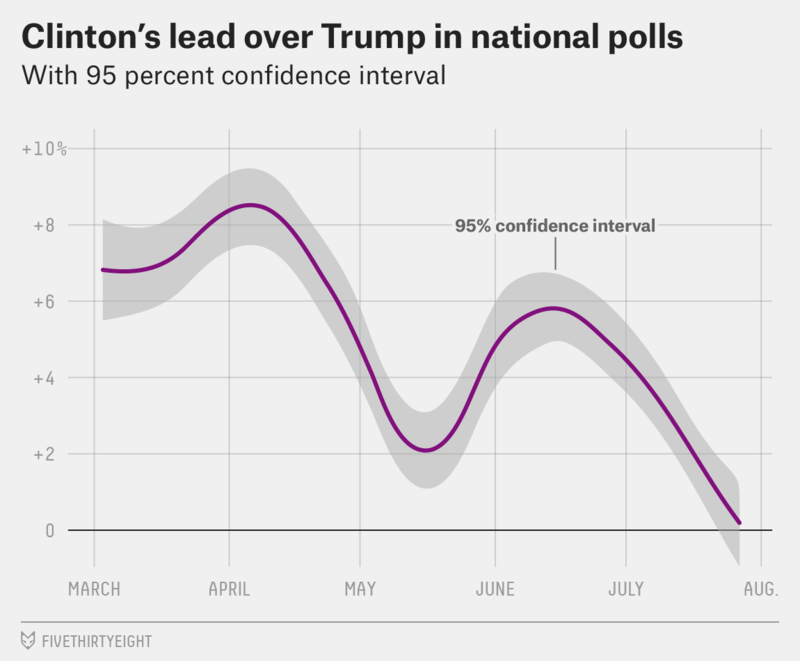 Donald Trump’s bounce, as measured by the FiveThirtyEight now-cast, was roughly in line with the recent trend, about 3 to 4 percentage points. Could Clinton get a 10-point bounce? Or no bounce at all? Sure — we don’t know enough about convention bounces to rule out either possibility. It’s not even clear whether convention bounces have to do with the efficacy of the conventions or the underlying conditions of the race (or some combination). Bounces seem to be larger in years when there are more undecided and third-party voters. They seem to be larger in years when the polls are more volatile heading into the conventions. Both those factors might portend larger bounces this year, since there are a lot of undecideds and the polls have been fairly volatile. On the other hand, bounces have gotten smaller over time, and perceptions of Clinton and Trump are relatively hard-wired compared with those of typical presidential candidates. Another way to think about conventions is that they help reset the race to equilibrium. In 1988, for example, George H.W. Bush headed into the conventions trailing Michael Dukakis despite conditions that seemed relatively favorable for Bush: The outgoing Republican president, Ronald Reagan, was fairly popular, and the American economy was in good shape. The conventions produced a big swing in the polls toward Bush, and he never looked back. What’s tricky about 2016 is that we don’t have a strong sense of what that equilibrium looks like. “Fundamentals” models like the ones that predicted Bush would beat Dukakis suggest that this election ought to be close, since the economy and President Obama’s approval ratings are about average. But those fundamentals-based models don’t have all that good a track record, and they potentially have trouble accounting for the effects of an unusual candidate like Trump. The assumption embedded in our polls-plus model, which adjusts for convention bounces and which held steady through the Republican convention, with Clinton having about a 60 percent chance of winning, is that she’ll exit the conventions in about the same position that she entered them. That would mean she’d hold a lead of about 3 percentage points by a few weeks from today, although it might be higher in the interim. That would leave her as a favorite, but a long way from a sure thing. But just perhaps, this convention will reveal the true colors of this race, when other events have failed to do so. If Clinton vaults to a 9 percentage point lead, or if she doesn’t get a bounce at all, that will be the clearest sign to date of where the race is headed. Although interestingly, if you chart the numbers, it’s not easy to distinguish Trump’s convention bounce from a continuation of the previous trend toward him.